Planners and smart growth advocates (I qualify) have generally urged land use policy and project decisions that result in a more "dense" and mixed-use urban environment. According to an article in the Thursday, April 3, 2014 edition of the San Francisco Chronicle, San Francisco is the second most dense city in the United States, right after New York City. The benefits? Well, I tend to think of benefits like preserving open space and farmland, and reducing air pollution and energy use. 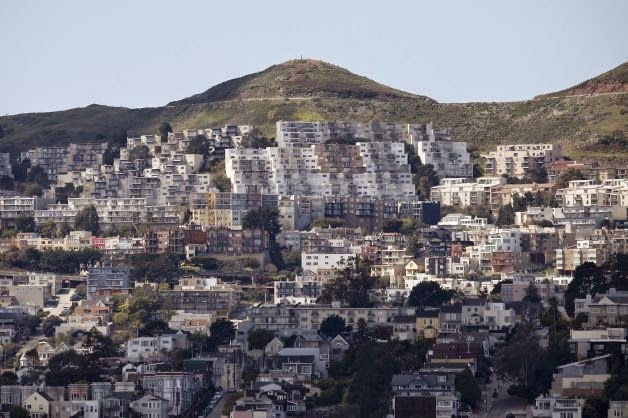 The article says, though, that residents of cities like San Francisco have "increased health and safety, better chances of upward economic mobility and lower transportation costs." Not to mention that "the denser the city, the longer people live." We get about another three years of life if we live in a denser urban environment. The study compares growing dense urban centers with growing urban sprawl communities. It does not compare these communities with stable "non-sprawl," or "built-out" communities, where growth is less of a factor. Though I'm not aware of any such study (yet), I would doubt that the same results would be found comparing San Francisco with my home town of Chadron (population ~2,000) in western Nebraska. It is growth that causes the problems in urban environment, more than the physical arrangement of the people therein. One could equally argue that rather than sprawl or maximum density, optimum community size would be a determining factor in quality and length of life considerations for its occupants. After all, the study was for "Smart Growth America!"